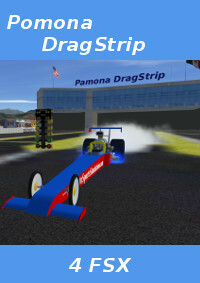 Pomona DragStrip 4 FSX being made for Microsoft Flight Simulator is for race car simulation, which could be made into a multi user game of your own liking. But Frankly it can make the ideal game for two ! Pomona DragStrip 4 FSX provides a whole new way to enjoy the world of simulation using Microsoft Flight Simulator ™ (FSX). Since the 50's, Dragracing has been a popular hobby for some and a serious commtiment for others. Pomona DragStrip 4 FSX is Scenery and located adjacent to Brackett Airport in La Verne California. This is a fantastic rendition of the Le Mans (France) race track for FSX. True to scale and loaded with eye candy. The surface is smooth enough to go 250 kts. The curves are true to life (must slow down to 70 kts) so beware. OK Daley invested MANY months in making this track. I have been waiting for 10 years for this. And the price is VERY reasonable considering the QUALITY of scenery and the time, and effort, invested to accomplish this KILLER scenery by OK Daley. If your PC is slow you can de-activate the 'Objects' scenery part. You will not have the eye candy but will be able to get the higher fps you need for a smoother driving experience. GET IT. You will be glad you did. The race cars (at Simviation) by OK are adequate and easy on frames for even online racing with your friends. GET THEM TOO.